The year 1864 was shaping up to be a critical one in the three-year-long Civil War. During the previous year, Federal armies had gained control of the Mississippi River and consolidated their grip on Tennessee. Only two significant Confederate military forces still remained in the field. In northern Georgia, General Joseph E. Johnston’s Army of Tennessee, having retreated from Chattanooga, was engaging Maj. Gen. William T. Sherman’s Union forces on their drive toward Atlanta. Meanwhile, in the eastern theater, General Robert E. Lee’s redoubtable Army of Northern Virginia was opposed by the long-suffering Army of the Potomac, still buoyed by its great, if incomplete, victory at Gettysburg six months earlier. In February 1864, the ever-aggressive Lee planned once again to take the offensive. Recognizing that the Confederacy lacked the resources to gain a permanent advantage by a lengthy campaign in northern territory, he aimed to embarrass the enemy and prevent them from initiating a major campaign of their own. In mid-March, Lee learned that Lt. Gen. Ulysses S. Grant had assumed command of all Union armies. Toward the end of the month, northern newspapers reported that the new Federal commander intended to make his headquarters in the field with the Army of the Potomac. This indicated that Virginia would be his main theater of operations. Southern scouts confirmed that Grant had indeed joined Maj. Gen. George G. Meade at Culpeper Court House, a small Virginia town immediately north of the Rapidan River. Lee monitored Meade’s growing buildup with concern but not panic. The instrument to accomplish this was the Army of Northern Virginia. Heading Lee’s three corps were Lt. Gens. Longstreet, Richard S. Ewell, and Ambrose Powell Hill. Lee’s premier fighting unit was Longstreet’s I Corps, which came primarily from the Deep South. On the face of it, Lee’s plan was logical. A few miles below the Rapidan fords on Lee’s right sprawled a densely wooded area known as the Wilderness of Spotsylvania. From the Confederate perspective, this location offered an ideal battlefield. Meade’s artillery and cavalry would be severely handicapped, and he would have difficulty applying his superior numbers in force. The 70-mile-wide, 30-mile-long stretch of second-growth timber, wiry underbrush, brackish water, and barren soil was all too familiar to the Union soldiers—they had suffered a disastrous defeat there at Chancellorsville exactly one year earlier. Indians legends said the Wilderness was haunted, and no one who had survived the previous spring’s debacle doubted it in the least. Both sides spent the whole day of May 7 straightening out their positions, but that night Grant withdrew to the northeast. Lee had fought Grant to impasse and occupied a strong position along high ground. Grant, who was probably the least superstitious man in either army, had no fixed plan of campaign beyond the general idea of avoiding the strong defensive line occupied by Lee at Mine Run and finding a way to draw him into an open battle. “My general plan,” he recalled later, “was to concentrate all the force possible against the Confederate armies in the field. To get possession of Lee’s army was the first great object. With the capture of his army Richmond would necessarily follow.” The only question was where. Federals had mustered nearly 120,000 men and 316 guns. The Army of the Potomac had been organized into three corps—the II, V, and VI—commanded respectively by Maj. Gens. Winfield Scott Hancock, Gouverneur K. Warren, and John Sedgwick. The IX Corps, reorganized under Maj. Gen. Ambrose E. Burnside, was intended to function as a mobile reserve. The Confederates, for their part, had only 64,000 men and 274 guns. The Army of Northern Virginia stood on the east side of the Rapidan River. Mine Run was on its right, extending north. The Federals realized the difficulty involved and wanted to avoid fighting in the Wilderness if at all possible. Grant planned to send Meade’s Army of the Potomac, supplemented by Burnside’s corps, directly against Lee, while Maj. Gen. Benjamin E. Butler’s Army of the James advanced up its namesake river toward Richmond and another army under Maj. Gen. Franz Sigel threatened the Confederates’ western flank. Lee, meanwhile, decided to wait and strike Grant when he crossed the Rapidan. The river drew an unofficial boundary between Union-held northern Virginia and the rest of the state still under Confederate control. Lee’s troops remained behind their works lining the river’s southern bank, just above the village of Orange Court House. On the river’s far side stood Meade’s army. On May 4, Lee sent another letter to Jefferson Davis, stating: “You will already have learned that the army of General Meade is in motion, and is crossing the Rapidan on our right, whether with the intention of attacking, or moving toward Fredericksburg, I am not able to say. But it is apparent that the long threatened effort to take Richmond has begun, and that the enemy has collected all his available force to accomplish it. 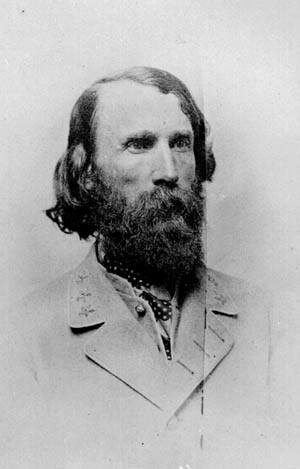 Success in resisting the chief armies of the enemy will enable us more easily to recover the country now occupied by him.” Other than writing to the Confederate president, Lee made no other preliminary moves to reunite his scattered army, which was still in various winter camps at Orange Court House, Gordonsville, and Clark’s Mountain. Perhaps Lee underestimated his new opponent—he had usually faced inferior generals on the battlefield. Lee’s I Corps commander, James Longstreet, had no such misperceptions. He had been Grant’s closest friend in the prewar army and had even served as best man in Grant’s wedding to a Longstreet cousin, Julia Boggs Dent of St. Louis. He understood Grant in a way that Lee did not. “That man,” he warned, “will fight us every day and every hour till the end of the war.” Lee ignored the prescient warning. By the afternoon of May 4, the first critical phase of the Federal offensive had been completed: the crossing of the Rapidan at Ely’s and Germanna Fords. The cavalry had crossed the night before to establish a bridgehead and scout ahead. Once on the opposite bank, each of the Federal corps had headed in a southeasterly direction but had gone only a short distance before making camp. Warren’s corps went only as far as Wilderness Tavern, six miles south of the river. At the same time, Hancock stopped his command a shorter distance from the Rapidan at defeat-haunted Chancellorsville. Sedgwick, meanwhile, followed Warren’s route and had encamped along the road leading to Wilderness Tavern, one of the few landmarks in the gloomy woods. The army’s supply train was not expected to be south of the river until late ­on the fifth. The Union soldiers, many of them as green as grass, camped for the night amid the disinterred remains of their hastily buried comrades at Chancellorsville. As night thickened, they grew uneasy, seized by “a sense of ominous dread which many of us found impossible to shake off.” “It was a very easy matter to discover just where pools of blood had been,” noted one soldier, “for those particular spots were marked by the greenest tufts of grass and brightest flowers to be found upon the field.” A veteran cavalryman pried up a bullet-shattered skull from a shallow grave and rolled it across the ground at the new men. “That is what you are all coming to,” he said, “and some of you will start toward it tomorrow.” Another veteran warned that “the wounded are liable to be burned to death.” Few soldiers slept well that night. Providing all went as expected, Grant would meet Lee’s forces where the North’s numerical superiority could be used to its advantage. However, that afternoon he and Meade made a critical decision that shaped the nature of the upcoming battle. Meade’s original plan called for the infantry to march at a sustained pace throughout the day. They had started just after midnight, and a forced march would bring them through the Wilderness before sunset. Meade’s timetable assumed that Lee would be taken by surprise and would react slowly, allowing the Army of the Potomac to maintain the initiative. If Lee moved first, however, all those careful calculations would be upset. The problem was the massive army wagon train. The infantry might clear the Wilderness by nightfall, but it would be impossible for its wagons to do so. Accordingly, and with Grant’s approval, Meade halted the march in the afternoon to allow the wagons to catch up, thus giving Lee the opportunity to initiate hostilities in the Wilderness, where odds favoring the Confederates were the greatest. The Confederate leader already had decided to divide his army, outnumbered 2-to-1, and march toward the Federals. The scheme entailed risk, but Lee counted on the dense underbrush of the terrain to offset Grant’s considerable advantage in troops and weapons. The Wilderness was traversed by four principal roads. Two ran south from the Rapidan, and two ran east from Orange to Fredericksburg. The Army of the Potomac was marching on the roads running south. Lee would soon move along those heading east. Both sets of roadways intersected in the vicinity of Wilderness Tavern, a ramshackle stagecoach depot five miles below the Rapidan. 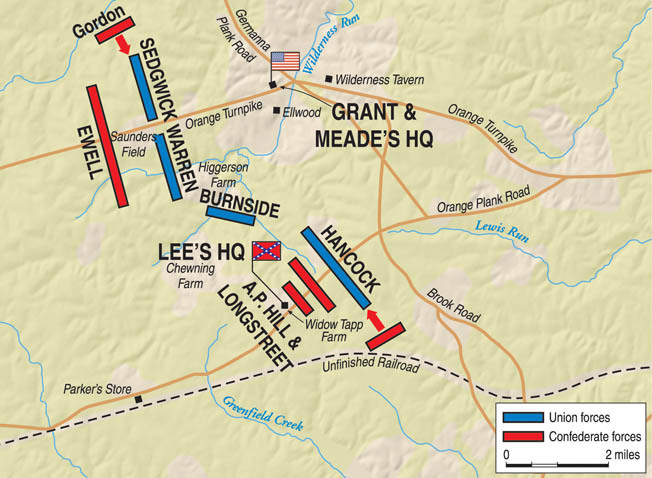 If Lee were to encounter Meade in the midst of the Wilderness, he would have to take steps to stall the Union advance. Otherwise the Federals might march through the Wilderness before he had sufficient opportunity to maneuver his own army into place. Grant and Meade had crossed the Rapidan below the main position of Lee’s army, Confederate headquarters being at Orange Court House. After crossing, while Grant was waiting for lunch, a courier brought a message from a signal corps station in the rear, which had intercepted and deciphered a dispatch from a Confederate station on Clark Mountain. It stated that Ewell, commanding the left wing corps of Lee’s army, was already moving forward, apparently meaning to cut the Federal line of march. Lee’s purpose was to pin Grant in place with Ewell and Hill, then swing his entire army into action. Grant immediately ordered Burnside to force march his IX Corps from the Rapidan and rejoin the rest of the army. Early on May 5, Ewell deployed along the western edge of a clearing named Saunders’ Field. Meade ordered Warren’s V Corps to attack immediately, but the troops were unable to form rapidly in the woods. First light came early in springtime Virginia, and by 5 am, Union columns had been on the march to take their positions. Warren rode to the front and reluctantly ordered the advance to begin. The slightly built general had been born in New York and attended the United States Military Academy at West Point. During the war, he had served during the Peninsula campaign and at Fredericksburg. He had initiated the defense of Little Round Top during the Battle of Gettysburg, an act that had won him a promotion to major general. The inbred caution of the Army of the Potomac prevented the hammer blows Grant wanted from being delivered promptly, and the time lag worked to Lee’s advantage. Ewell’s II Corps moved east toward Grant along Orange Turnpike. Lee reminded Ewell that he was not to bring on a major engagement until Longstreet arrived, instructing him: “Captain [R.E.] Wilbourn reports everything moving to our right except cavalry, if so, better move the divisions to occupy lines at Mine Run, and be prepared for action.” By then, Grant was advancing in force to meet the thrust on his right. Ewell’s corps advanced until 10 o’clock, when sud­denly it was brought to a halt about two miles from where the old Ford Road crossed the turnpike. Ahead, Federal troops were moving south through the intersection of the two roads. Just hours before, Union headquarters had learned of Ewell’s advance up the Orange Turnpike, and Meade had immediately ordered Warren, whose divisions, had already moved past the intersection of the turnpike and Germanna Ford Road, to reverse his course and attack the Southern force. Meade again ordered Warren to attack immediately, but his troops had trouble forming in the woods. It was nearly 11 am before V Corps’s lead division first made contact with Brig. Gen. John M. Jones’s Confederate brigade. “A red volcano yawned before us,” one Maine soldier remembered, “and vomited forth fire, and lead, and death.” The woods became a bedlam of noise, so loud that the soldiers could not even hear their own rifle fire. The furious Union assault caught Jones’s troops by surprise. They broke for the rear. Before long the 5th Confederate Brigade, which had been posted behind Jones, was also caught in the confusion and left in a temporary state of panic. Jones, seeing his line waver, rode to the front to encourage his troops. Soon he was cornered by two Pennsylvania privates, who demanded that he surrender. Refusing to hand over his sword to men of lesser rank, Jones remained on horseback. Unimpressed, the Northerners simply shot him off his horse and stole his sword. Jones died immediately. The entire II Corps was in a desperate situation. Ewell quickly brought up Brig. Gen. John B. Gordon’s brigade, which managed to check the Union advance. Spearheading Gordon’s advance was a leather-lunged private from the 26th Georgia. Nicknamed “Gordon’s Bull,” James E. Spivey emitted a truly awe-inspiring battle cry, described by listeners as “a kind of scream or low, like a terrible bull, with a kind of neigh mixed along with it, and nearly as loud as a steam whistle.” Inspired by Spivey’s unearthly yelling, Gordon’s men struck the famous Iron Brigade, commanded by Brig. Gen. Lysander Cutler. For the first time in its proud history, the Iron Brigade broke and ran, leaving behind a pair of silver bugles that the Georgians scooped up and added to their own regimental band. Ewell’s fortunes improved as other brigades, including Brig. Gen. Cullen A. Battle’s command, joined the fight. Before long the Federals were outflanked and forced to withdraw. Union reinforcements consisting of two full divisions were mov­ing by then, but they could do nothing to stall the Confederate counterattack. Ewell’s men had regained the ground lost at the outset of the struggle. At that point, he halted his brigades where they were and had them dig in on both sides of the road. Eventually, the Confederate works extended for about a mile north and south of the turnpike. For the balance of the day, Warren attempted without success to drive Ewell’s corps from its defenses. Ewell, born and raised in Virginia, was another West Point graduate, having later served in the cavalry during the Mexican War. He had joined the Confederacy in 1861 and was promoted to brigadier general. As a major general, he had commanded a division during Stonewall Jackson’s inspired Shenandoah Valley campaign. A severe knee wound during the Battle of Groveton had resulted in the amputation of Ewell’s right leg, but he returned to duty as a lieutenant general in May 1863. Subsequently, he fought at Gettysburg with questionable results before participating in the Wilderness battle. Although outnumbered more than 3-to-1, the Confederates successfully halted the enemy’s advance, while inflicting heavy casualties of their own. The Union leadership committed more men into the fight, thereby increasing the pressure on the already hard-pressed defenders. Hancock advanced again and the weight of the attack began to tell. A portion of Heth’s force was in danger of giving way at a critical moment. Hancock then launched a massive frontal attack and later hit the enemy’s left flank, ultimately resulting in the rout of the Confederate III Corps. Hancock, born in 1824 in Pennsylvania, had distinguished himself at Gettysburg. 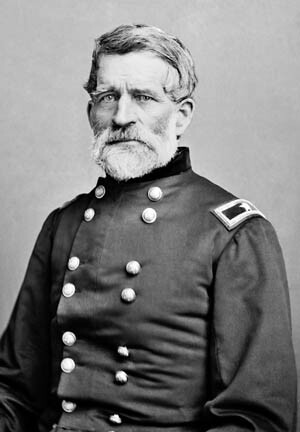 Grant considered him in many ways his most able general. To prevent reinforcements from being provided to assist Hill, simultaneous attacks were made against other Confederate units. The Southern right offered some resistance at first, but the strength of the Federal offensive quickly began to tell. Grant, understandably, had a different view of the situation. “I feel pretty well satisfied with the results of the engagement,” he told Meade, “for it is evident that Lee attempted by a bold movement to strike this enemy in the flank, but in this he failed.” Grant’s plan for May 6 was simple enough: Warren and Sedgwick would renew their attack against the Confederate II Corps, hold Ewell in place, and prevent any reinforcements from being sent to Hill. Hancock, meanwhile, reinforced with all available forces, would deliver the principal Union attack along the Orange Plank Road and annihilate Hill before Longstreet arrived. Meanwhile, Grant recommended that everyone try to get a little sleep. “We shall have a busy day tomorrow,” Grant advised, “and I think we had better get all the sleep we can tonight. I am a confirmed believer in the restorative qualities of sleep, and always like to get at least seven hours of it.” In the pitch-black battlefield around him, thousands of Union and Confederate soldiers were already sleeping their last sleep. Longstreet’s corps, which since its arrival from Tennessee had been posted at Gordonsville, 20 miles distant from Hill, was delayed in reaching the scene. At first light, Hancock attacked. With the help of Wadsworth, he easily overwhelmed Hill and poured into Widow Tapp’s Field, where Lee had his headquarters. “We are driving them beautifully,” Hancock cried. “Tell Meade we are driving them most beautifully.” At the last moment, Longstreet’s Confederates reached the clearing. David M. Gregg’s Texas brigade led the way. The Texans cheered lustily as their line of battle passed through their comrades’ disordered columns. Lee himself rode out to greet them. “Who are you, my boys?” he cried. “Texas boys!” they yelled back. “Texans always move them!” Lee cried. Enlivened by the greeting, Lee spurred his horse through an opening in the trenches and followed Gregg’s men as they moved rapidly forward. When the men recognized him, they cried: “Go back, General Lee! Go back! We won’t go on unless you go back!” With some difficulty, Lee’s aides managed to turn around the general’s horse. Longstreet, coming upon the scene, thought that Lee was “off his balance.” Finally, the Confederate leader retired out of danger. Longstreet gasped out a final order directing his men to take the Brock Road, but his wounding had broken the Confederate momentum. When the gray-clad troops finally resumed their advance some four hours later, the results were disastrous. They ran into a strengthened Federal line and, after a difficult struggle, were repulsed. The fighting now settled down on the Southern right. Lee once again attacked Hancock, who was entrenched along the Brock Road. A portion of Hancock’s works ignited, and Southerners poured through the breach, only to be driven back by well-placed Union artillery. Fighting closed around 6 pm. Shortly before dark, Gordon assaulted the northern end of Grant’s line and overran a portion of Sedgwick’s corps. Darkness ended the attack. With the repulse of Gordon’s attack on the Union right, the two-day Battle of the Wilderness came to a close. Grant had suffered a tactical defeat, but he persisted in his strategic goal of attempting to destroy Lee’s army. Lee had thwarted a well-provisioned force twice as large as his own, but his grievous loss in men had fatally gutted his offensive capacity. Henceforth, the Army of Northern Virginia would fight defensively. The Federals had suffered 17,666 causalities (2,246 killed, 12,073 wounded), the Confederates, 7,750. In all, five generals were killed, six wounded, and two captured. The deadly logic of Grant’s mathematical equation remained the same: the more men he lost, the more men Lee would lose, and Grant had more men to lose. The numbers were all on his side. The Battle of the Wilderness marked the beginning of a 40-day campaign that included some of the bloodiest fighting of the Civil War. For the troops of the Army of the Potomac, the realization that they were moving south—not retreating north again—was uplifting. When Grant and Meade rode past the ranks, wild cheers echoed through the forest. Following the stalemate of the Battle of the Wilderness, the Federal army moved toward a key junction on the way to the Confederate capital of Richmond. The Army of Northern Virginia successfully blocked the way, and the Battle of Spotsylvania Courthouse ensued. Early on May 12, Grant struck hard at “Bloody Angle,” trying to eliminate the salient. For almost a week the Federals probed the Confederate flanks, but found no exploitable weakness. The battle, which finally ended on May 20, had been costly. Casualties included 17,400 Federals and 9,600 Confederates.